There's nothing "barely tamed" about the 2018 Audi R8; this baby is a pussycat. At least, when cruising around town. But unleash the 610-horsepower V10 engine on a racetrack and you'll hit 205 mph. It offers all the incredible performance of a modern exotic supercar, but with the civility and daily livability of an Audi luxury sedan. My vehicle is a stylish, comfortable, luxury car. This vehicle performs really well. High speeds, great look and comfort and Wi-Fi hotspot. The vehicle is very safe and has soft seats, also a stylish look that makes you show off your style. Many people of all ages, race, and taste will like this vehicle and I think they should buy it if they are looking for a car like this. It is costly but it is worth the money! The car is just a beauty overall. The front grills as well as the structure of the car is just what I want in a car. Honestly I have no dislikes or complaints currently as this car is just great! That it shifts like butter. I like how it shifts. It handles very well and accelerates good. It is a nice and clean design. I do not like how it is so expensive. 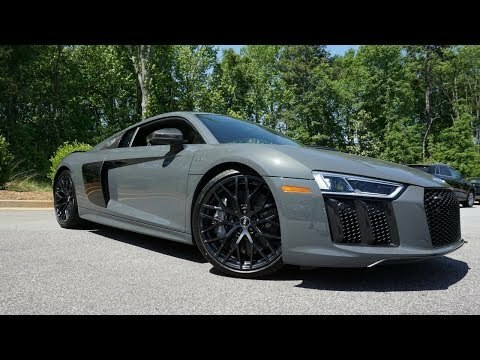 The BRAND NEW 2018 Audi R8 V10 PLUS Review!! From A Tall Guys Perspective..
Volkswagen Group of America, Inc. (Volkswagen) is recalling certain 2017-2018 Audi R8 Spyder and R8 Coupe vehicles. Transmission fluid may leak from the gearbox ventilation hose after certain high speed and maneuvering situations. If leaked transmission fluid contacts hot engine parts, it can increase the risk of a fire. Audi will notify owners, and dealers will replace the single gearbox ventilation hose with a double ventilation hose, free of charge. The recall began October 18, 2018. Owners may contact Audi customer service at 1-800-253-2834. Volkswagen's number for this recall is 34J1.